Gears of Halo - Video game reviews, news and cosplay : What is the plot of 'The Duel' in the Halo Legends anime film series? What is the plot of 'The Duel' in the Halo Legends anime film series? The Duel is the second film in the Halo Legends short film series. The first was The Babysitter. The Duel was originally shown on the new Halo Waypoint that you can download to the dashboard of the Xbox 360. The next chance to see it will be if you get your hands on the Halo Legends DVD which be released on the 9th of February 2010. 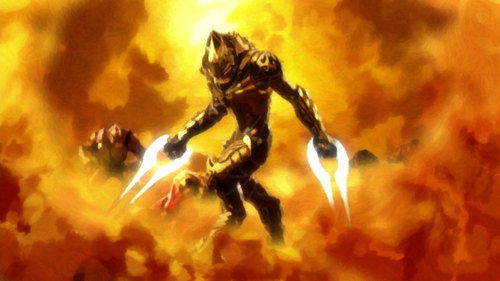 In the anime "The Duel," a Sangheili Arbiter named 'Fal' is charged with heresy by a High Prophet, because of his blatant and rebellious refusal to accept the Covenant's religion, despite threats made against his clan (think a Christian refusing to renounce his belief system for another's equivalent type scenario). A second Sangheili serving the unnamed Prophet named 'Haka' takes his own initiative against Fal, forcing a servant of his to kill his wife Han whom clearly was in love with Fal, and him with her. Haka then proceeds to kill Fal's servant and leaves both of their bodies in Fal's home. When Fal ulimately discovers what Haka had done, he is enraged and begins a personal war against Haka's troops, even his fellow clansmen, killing many of them until he finally is before Haka. The two duel, but it is a short struggle, as Haka slashes Fal across his chest, mortally wounding him. To his surprise, he quickly finds that Fal has impaled him on his own sword. Borrowing a classic sword-fighting premise from a million stories and films, both Sangheili fall, each having killed the other. Fal's last moments alive are concerned with thoughts his wife. As a result of Fal's actions as part of his actions leading to the Duel, the rank of Arbiter is stripped of its honour and is bestowed only apon the Sangheili who have been deemed to have no honor, in order that they might regain it. "“The Duel” takes place thousands of years in the past at the dawn of the Covenant. The story follows a shamed Elite who defies his role as an Arbiter to take a path of revenge against those that stole the only thing that mattered to him. This ancient Arbiter must fight his way through ever-growing groups of former allies (Grunts, Elites, Hunters and more) until he finally stands face-to-face with the Elite who betrayed him." The Duel's plot being set at the dawn of the formation of the Covenant gives us a small insight into the beginning events of the Halo 2 xbox game where the Arbiter, er... becomes The Arbiter. His disgrace at not having prevented the Master Chief from exploding the first Halo installation results in him being bestowed the title of Arbiter with the expectation that, as the "Blade of the Prophets", he will die trying to redeem himself. My point is that the Arbiter of Halo 2 and 3 has brought upon himself the same dishonour that Fal bought upon himself, thus 'earning' the title. Does the Duel have a New Zealand reference? In Maori, which is an official language of NZ, a 'haka' is a war dance which was historically done before a tribe battled another as a challenge. Now the All Blacks rugby team famously do one before each test match. I wonder if the name Haka is a reference to New Zealand and possibly the fact one of Bungie's main men, Chris Butcher is from New Zealand. Probably a long shot but does any one have any ideas?